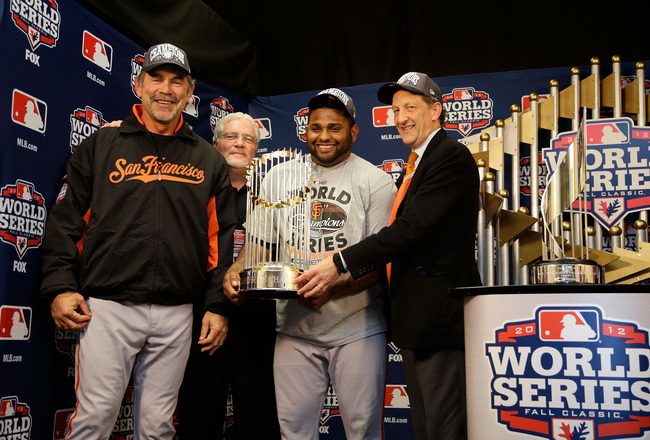 Bruce Bochy and the 2012 World Series MVP Pablo Sandoval celebrate the Giants World Series title. For the second time in 3 years the San Francisco Giants are the kings of baseball. San Francisco beat Detroit 4-3 in 10 innings Sunday night to sweep the Tigers. The Giants dominated this series with superb starting pitching and an oustanding bullpen. Matt Cain, Madison Bumgarner, Barry Zito and Ryan Vogelsong silenced the Tigers explosive bats all series. With help from former teammate Melky Cabrera in the All Star Game, the Giants had home field advantage for this series. The Giants did what other teams could not do in this postseason and that was to hit Justin Verlander. Pablo Sandoval’s three homers sent a statement in game one, as the Giants scored 8 runs to take a series lead. Behind 7 innings of shut out ball from Madison Bumgarner the Giants took a 2-0 series lead to Detroit. In game 3, Ryan Vogelsong was struggled with control, but Tim Lincecum picked him up out of the bullpen. Lincecum threw 2.1 innings of shut out baseball and set up for Sergio Romo to put the Giants one game from another title. Bruce Bochy turned to his ace Matt Cain in game 4 who struggled a bit giving up 3 earned runs in 7 innings. Both teams battled to extra innings, where in the top of the 10th Marco Scutaro’s rbi single scored Ryan Theriot, which would be the winning run. Sergio Romo closed the door in bottom of the inning and for the second time in three years the Giants are on the top of the baseball mountain again. Marco Scutaro’s rbi single in the top of the 10th clinched a title for the Giants. 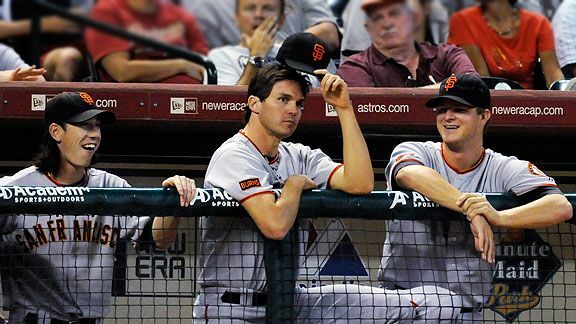 Tim Lincecum, Barry Zito and Matt Cain along with many others baffled the Tigers bats with superb pitching all series. This entry was posted in MLB and tagged Barry Zito, Bruce Bochy, champions, Giants, Madison Bumgarner, marco scutaro, Matt Cain, Pablo Sandoval, Ryan Vogelsong., Tigers, World Series. Bookmark the permalink.